Ever since the dawn of civilization, man has tried to cross boundaries; be it deserts, mountains, oceans. Marvelous examples of architectural genius by civilizations over the millenniums have left us in awe with their superior sense of design and functionality. 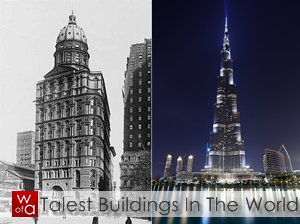 Just as the world has evolved over the centuries, so has the mind of great architects with it. 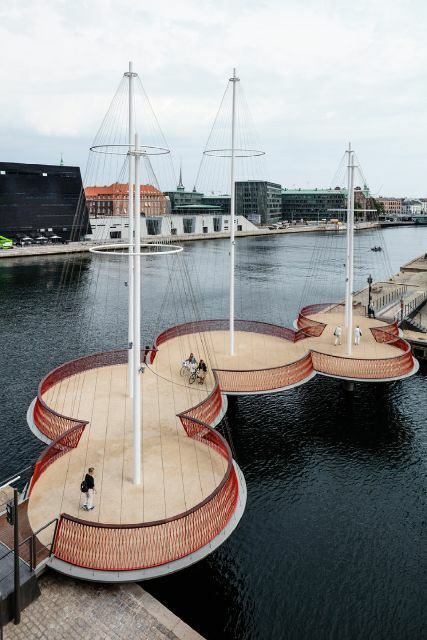 With award winning designs that have broken records across the world, we bring to you 9 outstanding examples of pedestrian bridge designs from around the globe that display the rich culture of the regions and also facilitate transportation between places. The Chapel Bridge is situated in the picturesque town of Lucerne in Switzerland. Originally built in the year 1333, the bridge crosses over the serene Reuss river diagonally. The Chapel Bridge is rich in culture and heritage, since it is the oldest covered bridge in the massive continent of Europe. The inside of this bridge is entirely adorned with paintings from the 17th century which depict various events in local history. As a result of an unfortunate fire that engulfed this beautiful piece of architecture nearly twenty three years ago, the bridge was nearly destroyed; near about two thirds of the bridge was lost that day, the fire taking along with it 85 of the 110 paintings inside the Bridge, some of which even dated back to 1611! The Bridge was rebuilt a year later and only 25 of the brilliant paintings could be saved or restored. The terrifying SkyBridge is located in Sochi and has been classified as the longest pedestrian suspension bridge in Russia. The experience that one has while traversing through it can be described in the most minimalist way as “exhilarating”! the bridge stretches for almost a kilometer over the beautiful Krasnaya Polyana valley, and can carry upto thirty thousand people at a time! There are also sporting options like zip lining along the bridge or bungee jumping from it, available from two different heights for both the iron and strong hearted. 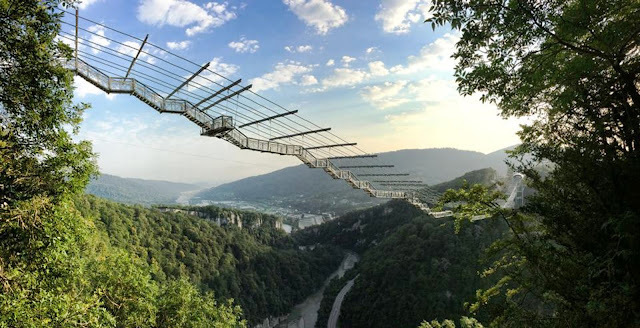 The view from the bridge will simply take away one’s breath, as stated by Vladislav Baranov, who is the spokesperson for Skypark AJ Hackett, responsible for running both of the adventure sporting activities. Even though the Pont du Gard is known primarily for its unusually large and exceptionally preserved aqueduct, you will witness the remarkable beauty of the bridge on the banks of the Gordon River. The Bridge was originally built because the citizens of Nimes were tired of getting parched in the sun and also because the body odor was too much, even for an era like 50 AD. The Romans had tapped into an underground spring around 31 miles away at Uzes and built an underwater aqueduct till the Gordon River. The Pont du Gard was built for this specific purpose and even after some 2000 years, it is still standing. The bridge is a brilliant piece of engineering with a difference of one inch in height from one end to the other and has been awarded the title of “Grand Site de France”; the spring in Uzes is still there as well. Designed by renowned architecture firm McDowell+Benedetti, the Scala Lane bridge will remind you of an apostrophe in the English language. 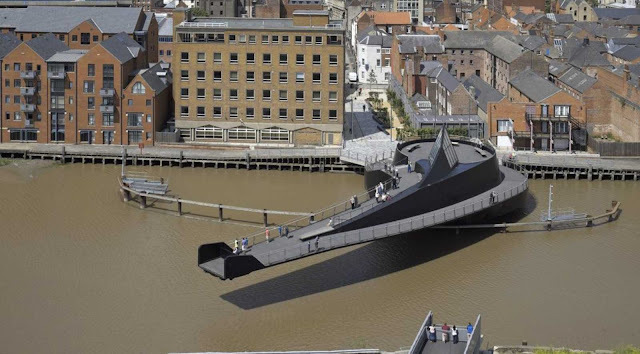 The steel black structure consists of an art installation by Indian artist Nayan Kulkarni, and it also doubles up as an alert system when the bridge is in motion. The pedestrians are allowed to ride on the swing bridge even when it opens up to accommodate traffic on the river. The Scala Lane bridge is unique mode of transport for the citizens of England as it sprawls across the Hull River. The Henderson Waves bridge was designed to resemble waves as one can surmise from the name itself. 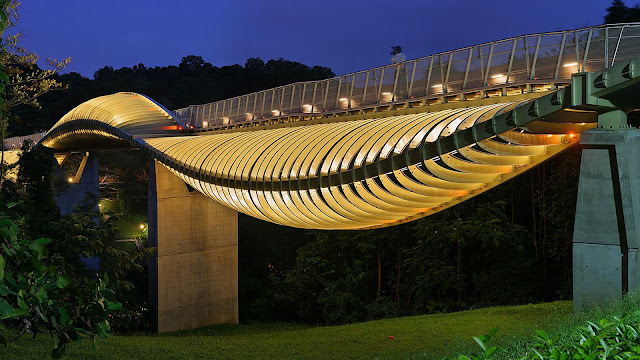 It acts as a connection between two of Singapore’s parks, namely the Telok Blangah Hill Park and the Mount Faber Park. The bridge offers a stunning view of Singapore’s natural beauty, and is lit up at night to add to the already artistic and futuristic design. Sitting at 118 feet above the busy Henderson Road, the Waves is the highest pedestrian bridge and overlooks the harbor, treetops and flowering bushes. The composition of the bridge is steel and timber, an unusual yet effective mix. The steel gives structural integrity and support to the bridge while the timber adds a natural touch to the already classy design. 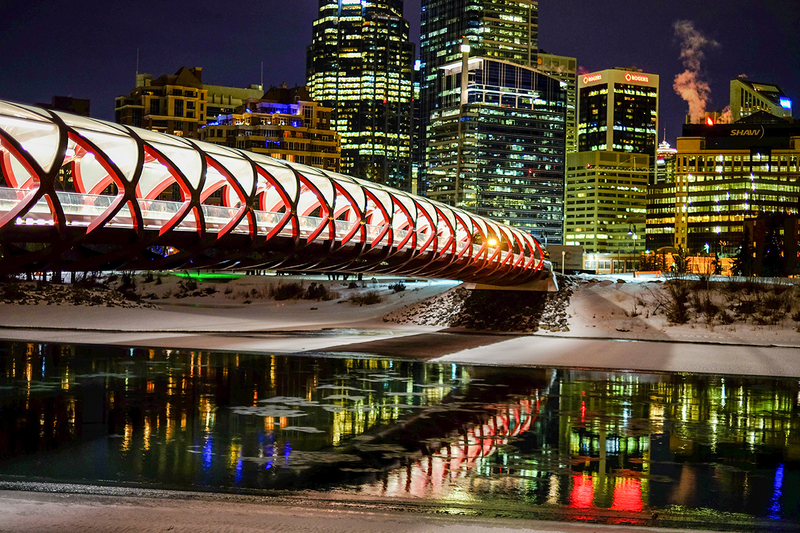 Architect Santiago Calatrava’s Peace Bridge was completed in the year 2012 and spans the Bow River in Calgary, Alberta. The bridge is primarily a connection between the downtown area of Calgary and the residential community of Sunnyside. It accommodates both cyclists in a central bike lane and pedestrians on the paths on either sides of it. The bridge features a partially enclosed helical structure with a glass roof and has no piers in the water in order to minimize the ecological footprint. The Peace Bridge has been ranked amongst the top ten architectural projects of 2012; it is used by nearly 6000 people per day as per reports. The Banpo Bridge is situated in the beautiful city of Seoul in South Korea over the Han River. This brilliant bridge is a cool blend of vintage and modern times since the bridge was created in 1982. But a project to revamp the same was launched in 2007 and in two years, it did exactly as asked. The Koreans decided to add fountains on both sides of the bridge which shoot 190 tons of water per minute from 380 nozzles. 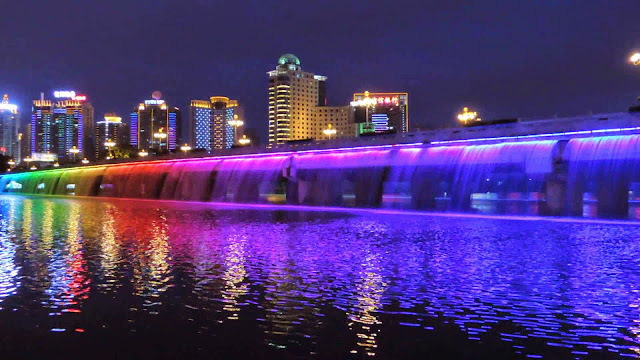 When the sun goes down, 10,000 LED lights on the bridge come alive and transform the fountain into a rainbow with spectacular effects and ever-changing displays. The bridge is eco friendly as it uses water from the river itself and recycles it continuously. The fountain entered into the Guinness Book of World Records in 2008 as the longest bridge fountain and is a triumph not only to South Korea but to architecture as well. The Rolling Bridge in London was originally designed as nothing but an experiment more than anything and the payoff for the pedestrians as a result? A spectacular view from on high! 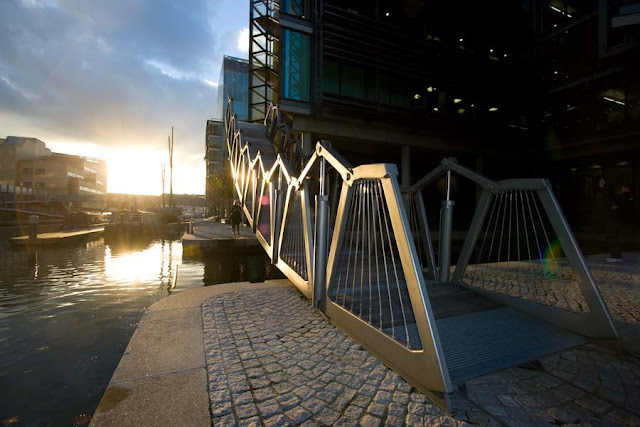 The bridge itself is a sight to behold, designed by Thomas Heatherwick, an architect of taste. The bridge is divided into eight sections which are linked with hydraulics built into the hand rail; it curls up and over until the ends meet, to allow passage for a single boat in or out of its moorage. Designed by Cecil Balmond and built by Portuguese-based engineer António Adão da Fonseca, the 900 ft Pedro e Ines footbridge spans the Mondego River and tests the limits of structural dynamics. With its lightning-bolt like shape, the bridge features a balustrade of colored glass crafted with a clear fractal pattern. The design of this popular foot bridge and its name is inspired from one of the greatest Portuguese love stories of the 14th century, a story of two star-crossed lovers engaged in a forbidden relationship. Each of the two cantilevered walkways is responsible for supporting the other, thus giving the impression that the bridge does not meet.